ATLANTA, Nov. 13, 2018 /PRNewswire/ -- Nearly half of Americans (49 percent) are feeling pressure to spend more than they can afford this season, up from 46 percent last year, according to an annual holiday survey by SunTrust Banks, Inc. (NYSE: STI). "We all want the holidays to be a time of happiness and relaxation, but the pressure to overspend robs people of the joy of the season and increases financial stress," said Brian Ford, financial well-being executive at SunTrust. "Money affects people in emotional ways, and we've found that those who have a better handle on their money are happier – in fact 64 percent of Americans with high financial confidence say the holidays are their favorite time of year." To help spread good holiday vibes throughout the season and into the New Year, SunTrust created a Holiday Confidence Guide to help people make small changes to their holiday budgets as well as a Holiday Calculator to guide them as they plan for the cost of gifts, entertainment and travel this season. Make a list, check it twice… and stick to it: Design your holiday budget to fit your needs. Allow yourself to be merry by setting up auto-pay to take a little from each paycheck and place it into a holiday savings account. This can also help you pay down post-holiday debt. Set a gift spending limit: Talk with family and friends to level expectations in advance. Be smart as you shop: Keep an eye out for sales, and determine which deal days are smart for your big purchases. Don't let the figgy pudding set you back: While entertaining, become the hostess with the most-ess by entertaining at home and engaging your guests to help with holiday gatherings. Take a lesson from Scrooge: Review your finances after the merry-making, take time to feel thankful for all the ways you've shopped smart – and start thinking about your financial resolutions for the New Year. 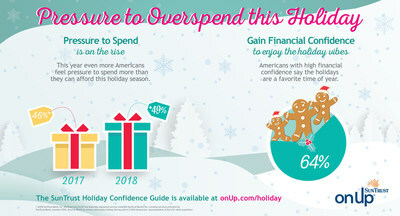 The SunTrust Holiday Confidence Guide and Holiday Calculator, along with other resources and tools to make the holidays the most wonderful time of the year for confidence and good cheer, are available at onup.com/holiday. SunTrust's nationwide holiday survey polls 2,500 Americans, and it is representative of the U.S. adult population and large enough to address Americans of different ages, incomes and geographic regions. SunTrust, a purpose-driven company, is leading the onUp movement to advance financial wellness in America. Through onUp.com Americans have access to free tools, resources and a community to motivate them to take steps to gain greater control and confidence around their money. SunTrust Banks, Inc. is a purpose-driven company dedicated to Lighting the Way to Financial Well-Being for the people, businesses, and communities it serves. SunTrust leads onUp, a national movement inspiring Americans to build financial confidence. Headquartered in Atlanta, the Company has two business segments: Consumer and Wholesale. Its flagship subsidiary, SunTrust Bank, operates an extensive branch and ATM network throughout the high-growth Southeast and Mid-Atlantic states, along with 24-hour digital access. Certain business lines serve consumer, commercial, corporate, and institutional clients nationally. As of September 30, 2018, SunTrust had total assets of $211 billion and total deposits of $160 billion. The Company provides deposit, credit, trust, investment, mortgage, asset management, securities brokerage, and capital market services. Learn more at suntrust.com.